Comedian and podcaster Marc Maron has a new show on Friday nights on IFC called Maron that has been on a for a few weeks. I was able to catch up on it this weekend and to my delight got to see both Maron and fellow comedian Dave Foley with a couple of nice steeshes. 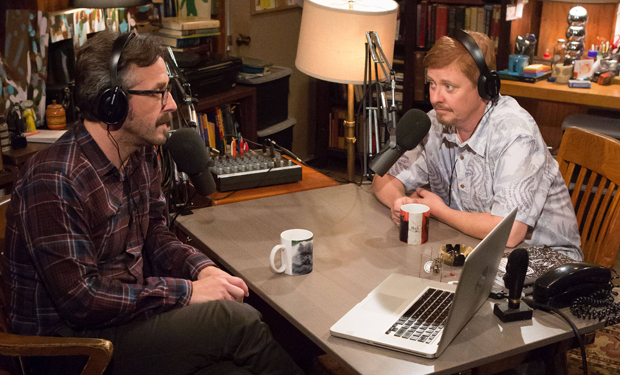 Maron, much like Louis C.K.’s Louie, follows a fictionalized Maron. Even though it’s not as good as the old shows on the TGIF lineup, it pretty good entertainment for a Friday night show. This entry was posted in Actor Mustache, Character Actor, Comedian Steesh, TV Steesh and tagged comedian, comedy, Dave Foley, entertainment, friday night, friday nights, funny, Humor, IFC, Louie, Louis CK, Marc Maron, Maron, Moustache, moustaches, mustache, mustaches, Podcast, TGIF, TV, WTF on May 14, 2013 by Los Bulls.